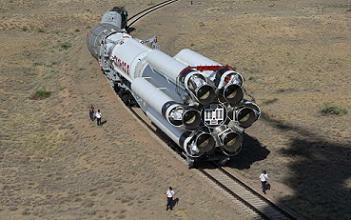 International Launch Services (ILS) launched their Proton-M rocket again from the Baikonur Cosmodrome in Kazakhstan. Launch occurred at 09:18 GMT, with the Proton’s Briz-M (Breeze-M) Upper Stage successfully deploying the SES-6 communications satellite into its super-synchronous transfer orbit after over 15 hours of flight. The Proton booster that launched the satellite was 4.1 m (13.5 ft) in diameter along its second and third stages, with a first stage diameter of 7.4 m (24.3 ft). Overall height of the three stages of the Proton booster is 42.3 m (138.8 ft). The Proton M launch vehicle is utilizing a five burn Breeze M mission design. The first three stages of the Proton used a standard ascent profile to place the orbital unit (Breeze M Upper Stage and the SES-6 satellite) into a sub-orbital trajectory. From this point in the mission, the Breeze M performed planned mission maneuvers to advance the orbital unit first to a circular parking orbit, then to an intermediate orbit, followed by a transfer orbit, and finally to a super-synchronous transfer orbit. Separation of the SES-6 satellite occurred approximately 15 hours, 31 minutes after liftoff. “This is a momentous occasion that we share with SES. Our relationship goes back two decades, starting with the signing of the first commercial Proton launch agreement – for the ASTRA 1F satellite,” noted ILS President Phil Slack. 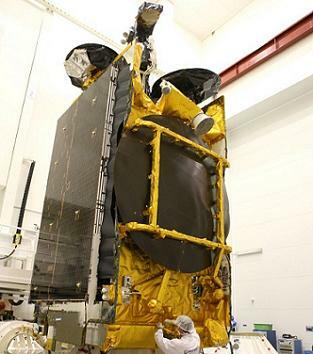 The Astrium-built SES-6 communications satellite is based on the E3000 Platform and has a mass of 6,100 kg. SES-6 is a multipurpose satellite will be replacing NSS-806 at 319.5 degrees east to provide significant capacity expansion over North America, Latin America and the Caribbean, Europe, and Atlantic Ocean region. The satellite’s expanded Ku-band payload will support DTH platforms, VSAT services and government digital inclusion programs throughout Latin America. The C-band payload will add incremental capacity to support channel growth at this key cable neighborhood. With three C-band 36 MHz equivalent transponders and 48 Ku-band 36 MHz equivalent transponders, the bird is expected to have a service life of 15 years. “With this launch we are able to fulfil demand in Latin America and the Caribbean, where we are seeing rapid growth. We will also be able to provide uninterrupted coverage for our customers in the Americas and Europe,” added Romain Bausch, SES CEO. This was the fourth ILS Proton launch of 2013 and the 81st ILS Proton launch overall. It also marked the 22nd SES satellite and the 16th Astrium satellite to be launched on the Proton, but only the second Commercial SSTO mission. (Images via ILS and Astrium).